Forecasters have warned of very low temperatures overnight, after snow brought a fifth day of chaos to the UK. Road, rail and air transport was again badly affected, while hundreds of schools were again closed. 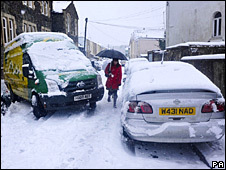 The West Country and south Wales were worst-hit, with Okehampton in west Devon seeing 22in (55cm) of snow. The BBC Weather Centre said snow would start dying out overnight, but temperatures in rural areas would drop as low as -10C. Susan Powell from the BBC Weather Centre said overnight conditions would be very icy, with temperatures in towns and cities dropping to as low as -5C. The front which brought heavy snow to the West Country would peter out as it moved east, though there would still some snowfall in eastern areas such as Kent. She said Saturday would include sunny periods, but overnight conditions would be even colder, with thawed snow turning icy. The Severn crossings were closed after ice began falling onto cars and smashing windscreens, but the M48 crossing has since reopened. Five windscreens were smashed on the second Severn Crossing - the M4 - on Friday morning, the Highways Agency said. Jim Clune, general manager of Severn River Crossing PLC, said sheets of ice measuring up to a square metre had fallen from overhead sign gantries. He said: "It's very much a safety hazard and, of course, these gantries span all carriageways on the motorways." 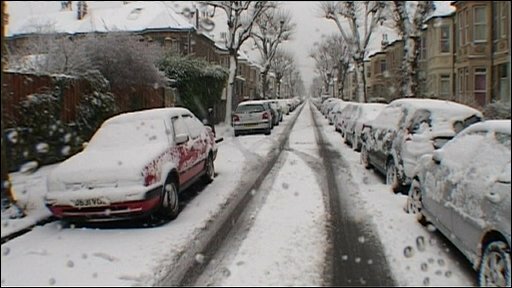 Heavy snow, some of it a foot (30cm) deep, cut off some villages in Devon and Somerset and snow continued into Friday. The bad weather left 21,000 homes across the West Country without power. Western Power Distribution (WPD) said 12,000 residents in Devon were without electricity. Another 8,000 homes in the Taunton area were also without power. "We have everyone available working on this. We hope to restore power to as many people as we can today," a WPD spokeswoman said. The AA had received more than 3,000 callouts by 0930 GMT on Friday, double its normal workload, and it warned that shortages of road salt had created a "road safety crisis". It said that by the end of Friday it expected to have answered 70,000 calls since Monday. Emergency services had spent Thursday night rescuing about 200 stranded motorists from the A38 at Haldon Hill, near Exeter, Devon after the weather deteriorated suddenly. A few miles west, the Army was called in to pick up about 60 people stuck on the A386. Many drivers in Devon and Cornwall spent Thursday night in emergency centres. A young couple are recovering after being stuck for 12 hours in an upturned car which was stuck in a ditch near Camelford in Cornwall. Police spent six hours searching for the pair, aided by a Royal Navy helicopter and Cornwall Search and Rescue volunteers. The Met Office warned that heavy snow was likely on high ground in Bath, Bristol, Devon, Dorset, Gloucestershire, Somerset, Plymouth, Swindon, Torbay and Wiltshire. Chiltern Railways, First Great Western, London Midland, Scotrail, Stansted Express and Virgin Trains have all been subject to cancellations and alterations. The Association of Train Operating Companies (Atoc) said, however, that 84% of trains in the UK were arriving on time. Flights at Bristol airport were closed until 1600 GMT, but are now operating a limited schedule. Thirty-one flights were cancelled. Easyjet has cancelled its Friday evening flights. Flights have also resumed at Luton, after it closed for the morning. However delays and cancellations were predicted. The runway at Stansted Airport in Essex was closed for an hour on Friday morning to allow snow to be cleared, causing six arrivals to be diverted and knock-on delays. In Northamptonshire, bus operator Stagecoach recalled all its vehicles to its depot, while Arriva suspended all its services in Hertfordshire. Airports operator BAA warned travellers to allow extra time for their journeys to other airports in case of adverse weather. The Highways Agency is warning against travel across much of south western England. The main route between north and south Wales - the A470 - is closed just south of Brecon. More than 3,000 schools closed across southern England and Wales, with hundreds more shut in Scotland. About a million pupils enjoyed the end of an unexpectedly short week at school and the start of an unpredicted long weekend. Grampian Police said some roads were closed or passable only with care due to heavy snow and fallen trees. Northern Ireland escaped snowfall overnight but it began snowing heavily on Friday morning, making conditions on minor roads treacherous. Some councils in England have been running out of road salt, with the Highways Agency saying supplies were "very limited". Authorities in Wiltshire hoped to get 500 tonnes of salt from Devon County Council. Stocks in West Berkshire are at 20% of normal levels and are expected to last only another two or three days. Cheshire-based Salt Union said staff were working around the clock but still could not meet demand. A container ship is travelling from Spain with 40,000 tonnes of salt, and another ship is also heading to the UK with salt from Germany. Both are expected to dock on Wednesday. Meanwhile, the Irish Salt Mining and Exploration in Carrickfergus, Antrim, is digging up to 6,000 tonnes of salt a day, having been inundated by calls from councils across the UK. Paul Bettison, chairman of the Local Government Association Environment Board, said eight councils had to prioritise supplies to focus on the most important roads. He said: "If that fails to deal with any issue, then councils will talk to the Highways Agency to look for further supplies." Are you having to spend the night away from home because of the weather? Do you have friends who've been left stranded? Has there been heavy snow overnight where you are? Please send us your comments and experiences using the form at the bottom. You may also send your pictures to yourpics@bbc.co.uk, text them to 61124 or you have a large file you can upload here.